Product information "Floral Printed Madder Linen Tie - Eggplant - Handrolled"
Eggplant linen tie with a floral print in brown. Perfect with a checked jacket, light blue shirt, white linen pocket square and blue bamboo braces. This is a new quality that we developed with a printing manufactory in Como which we call Madder Linen. The linen is dyed in that particular madder blue first and then the design is printed on top; screen printed, each color, step by step. The hand is drier than your average linen and the tie knot is just superb. Simply put, this is a wonderful summery alternative to classic ancient madder silk. 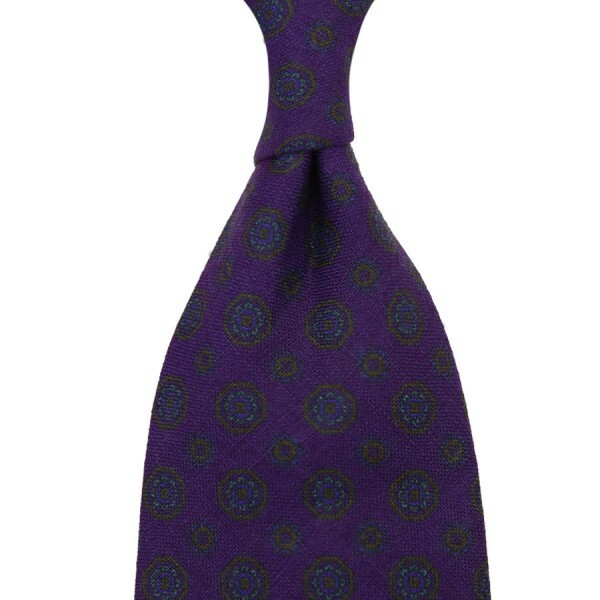 Related links to "Floral Printed Madder Linen Tie - Eggplant - Handrolled"